Metal soaps and resinates are known to be spontaneously formed in artistic paintings, as a product of the reaction between aliphatic and terpenoid acids released by hydrolysis and oxidation of the organic media and certain cations contained in some inorganic pigments. In this paper we present an optimization and the validation of a GC/MS method for the qualitative and quantitative analysis of mixtures of terpenoid acids and aliphatic mono and dicarboxylic acids and metal carboxylates of terpenoid and aliphatic mono and dicarboxylic acids in the same paint microsample. This is based on a two-step analytical approach entailing the subsequent use of two silylating agents, N,O-bis(trimethylsilyl)trifluoroacetamide for the analysis of free acids and metal carboxylates, and 1,1,1,3,3,3-hexamethyldisilazane for the analysis of free acids. The application of this approach is possible because of the good stability at room temperature of the TMS derivatives of aliphatic and terpenoid species, characterized by high boiling points and relatively low vapour pressures. The method was then applied to the characterization of samples collected from two reference paint layers aged for 20 years, a paint sample taken from a pulpit, and sample of the varnish coating of a wooden writing desk, both from the second half of the seventeenth century. Metal soaps are known to be spontaneously formed in artistic oil paintings, as a product of reaction between the excess of carboxylic acid moieties released by the hydrolysis of triglycerides as well as the oxidative cleavage of unsaturated fatty acids, and the metal ions contained in certain pigments [1–8]. Moreover, in manufactured oil paint formulations, since the 19th century, metal soaps (most commonly Zn and Al stearates) have commonly been added to facilitate the dispersion of pigments into the medium [9–11]. Metal carboxylates are also formed between terpenoid acids-deriving from plant resins used in coatings, varnishes and as ingredients of paint binders, and certain cations, as it has been discussed in several publications [12–17]. Finally, a special class of carboxylates, which are ubiquitous to paintings (and other artistic objects), is that of oxalates. These are considered to be the products of reaction between oxalic acid, formed upon oxidative degradation of the organic medium of a paint, and cations present in the paint film [18–21]. Formation of metal soaps, fatty acid efflorescences, drips, ooze and melting impastoes, and development of solvent sensitivity are important conservation issues in modern oil paintings [22–25]. Their molecular causes, the kinetics of their development, and mechanical implications are still object of open debate among the scientific community. The identification and quantification of mobile unbound fractions in paint layers may be important tools to be used to try to understand these phenomena, in the analysis of model samples and paintings. The identification and quantification of free fatty and dicarboxylic acids, and free carboxylates of fatty and dicarboxylic acids (not bound to the polymeric network, nor to glycerides) in samples from paintings and other artistic objects can be achieved using a new GC/MS analytical approach, based on the use of two different silylating agents: hexamethyldisilazane (HMDS), which reacts only with free fatty and dicarboxylic acids and N,O-bis(trimethylsilyl)acetamide (BSTFA), which reacts both with free fatty and dicarboxylic acids and of carboxylates of fatty and dicarboxylic acids [26, 27]. The drawback of this analytical approach is related to the sample size: the method entails the separation of the sample into two aliquots, one to be derivatized with HMDS and the other with BSTFA. This analytical approach can be considered exhaustive if applied on a sample with a good homogeneity. However, paint samples are often highly heterogeneous, and the amount of sample available is generally very low, making this approach unpractical in some cases. To address this limitation, we improved this analytical procedure , in order to perform the analysis on one single sample aliquot, in two subsequent steps: after derivatisation with HMDS the sample is dried under nitrogen flow, and thus derivatised with BSTFA. In order to evaluate if this approach is feasible and reliable, as the procedure is aimed at performing quantitative analyses, we performed statistical tests to verify that no sample losses occur. As the original analytical procedure  was only tested on fatty and dicarboxylic acids, we also evaluated the possibility of using this quantitative approach also on terpenoid acids which have different chemical structures than fatty and dicarboxylic acids, and may, thus, exhibit different reactivity towards silylating agents. To this aim, we synthetized lead abietate and we performed a full validation of the procedure. Abietic acid and lead abietate exhibit the same reactivity towards HMDS and BSTFA than fatty and dicarboxylic acids: the lead carboxylate is only derivatised with BSTFA and the free terpenoid acid is derivatised by both HMDS and BSTFA. By performing calibration curves, quantitative analyses are thus possible. In general it is possible that soaps between the same carboxylate and a different cation might have a different reactivity. A lower reactivity may be expected when the bond between the carboxylate and the metal is covalent with respect to when it is ionic. As it has been shown that lead carboxylates are characterized by bonds with a substantial covalent character [26, 28], we thus decided investigate into the reactivity of lead soaps. The procedure was also tested for the derivatisation of oxalates and oxalic acids. Results indicate that oxalates are not derivatised by either derivatising agents, and thus their analysis by GC–MS requires a previous hydrolysis step . This new analytical approach allows to characterize and quantify in one single micro-sample the free acids and metal carboxylates deriving from the lipid portion and to obtain for the first time a full e quantitative picture of the metal resinates present in the paint sample. The method was applied to characterise two model paint layers containing a drying oil and a pigment naturally aged since 1999, and two historical samples from Norway of the second half of the 17th century: a paint sample taken from a polychrome pulpit and sample of the varnish coating of a wooden writing desk. Bidistilled water, absolute ethanol, acetone, diethyl ether, n-hexane and iso-octane (HPLC grade, Sigma Aldrich, USA). Lead acetate, manganese chloride, copper acetate, cobalt acetate, lead nitrate, and stearic acid (purity > 99%, Sigma-Aldrich). Abietic acid, hexadecane, tridecanoic, hexadecanoic and octadecanoic acid, (purity 99%), (N,O-bis(trimethylsilyl)trifluoroacetamide (BSTFA) containing 1% trimethylchlorosilane (TMCS) and 1,1,1,3,3,3-hexamethyldisilazane (HMDS) were all purchased from Sigma-Aldrich. Fatty acid solutions were prepared in acetone, and contained lauric (4.10 µg/g), suberic (4.27 µg/g), azelaic (3.95 µg/g), myristic (4.11 µg/g), sebacic (3.85 µg/g), palmitic acid (4.39 µg/g), oleic acid (6.32 µg/g) and stearic (6.62 µg/g) acids. All standard solutions were used to derive calibration curves. The acids were purchased from Sigma-Aldrich, purity > 99%. Tridecanoic acid (purity 99%; Sigma-Aldrich) solution in iso-octane, 139.91 µg/g, was used as internal standard for derivatization; hexadecane (purity 99%; Sigma-Aldrich), solution in iso-octane,142.00 µg/g, was used as internal standard for injection. Lead stearate and palmitate were synthesized according to the reaction conditions reported in . Oxalic acid (purity > 99%, Sigma-Aldrich) solution was prepared in acetone with a concentration of 10 µg/g while calcium oxalate was purchased from Sigma-Aldrich (purity 99.9%). Lead abietate was synthesized by adding an aqueous solution (0.4 M) of lead acetate to an ethanolic solution of abietic acid at 70 °C with continuous stirring for 30 min. The precipitates were washed with warm water, acetone and diethyl ether in order to remove the salt excess and the unreacted abietic acid. The purity of lead abietate was tested according the procedure reported in . Two reference paint layers provided by Prof Leslie Carlyle, made in 1999 as part of the MOLART Program . These contained linseed oil as binder and two different pigments, lead white and vine black. Samples were naturally aged and preserved in laboratory at room temperature and RH%. Two historical samples: a paint sample taken from a polychrome pulpit from Norway (sample B53) and sample of the varnish coating of a wooden writing desk (DHU), both from the second half of the seventeenth century. The presence of pine resin and resinates in both samples was previously ascertained by means of GC/MS and FTIR. ATR-FTIR spectra were collected using a Perkin Elmer Spectrum 100 spectrometer coupled with a MIRacle TM ATR accessory equipped with a SeZn crystal. Sixteen scans were collected from 4000 to 650 cm−1 with a resolution of 4 cm−1. The analyses were performed at room temperature. Jasco Spectra Manager software was used for data analysis. The GC–MS system was made up of a 6890 N GC coupled with a 5975 Mass Selective Detector single quadrupole mass spectrometer, equipped with a PTV injector (Agilent Technologies). The mass spectrometer was operated in the electron impact (EI) positive mode (70 eV). The MS transfer line temperature was 280 °C, the MS ion source temperature was kept at 230 °C, and the MS quadruple temperature was at 150 °C. A combined procedure that allows the separation and characterization in the same microsample of three different fractions corresponding to saccharide, proteinaceous and lipid-resinous materials was used for the GC/MS analysis 31. To the samples 5 µL of tridecanoic acid solution was added, and then dried under nitrogen flow at room temperature to remove the solvent. The residual was subjected to derivatization for the GC/MS analysis with 20 µL of HMDS, 150 µL of iso-octane at 60 °C for 30 min. 5 µL of hexadecane solution were added just before injection as injection internal standard. 2 µL of the resulting solution were injected into the GC/MS. GC/MS instrumentation consisted of an Agilent Technologies 6890 N Gas Chromatograph coupled with a 5973 Mass Selective Detector single-quadrupole mass spectrometer. Samples were injected in splitless mode at 280 °C. GC separation was performed on a fused silica capillary column HP-5MS (J&W Scientific, Agilent Technologies, stationary phase 5% diphenyl-95% dimethyl-polysiloxane, 30 m length, 0.25 mm i.d., 0.25 μm film thickness). Chromatographic conditions were: initial temperature 80 °C, 2 min isothermal, 20 °C/min up to 280 °C, 10 min isothermal. MS parameters: electron impact ionization (EI, 70 eV) in positive mode; ion source temperature 230 °C; scan range 50–700 m/z; interface temperature 280 °C. The injection volume was 2 µL. The mixture obtained from the derivatization with HMDS was dried under nitrogen flow at room temperature, and subsequently added with 20 µL of BSTFA and 150 µL of iso-octane. The reaction time and temperature were set at 80 min and 80 °C. 2 µL of the resulting solution were injected into the GC/MS. 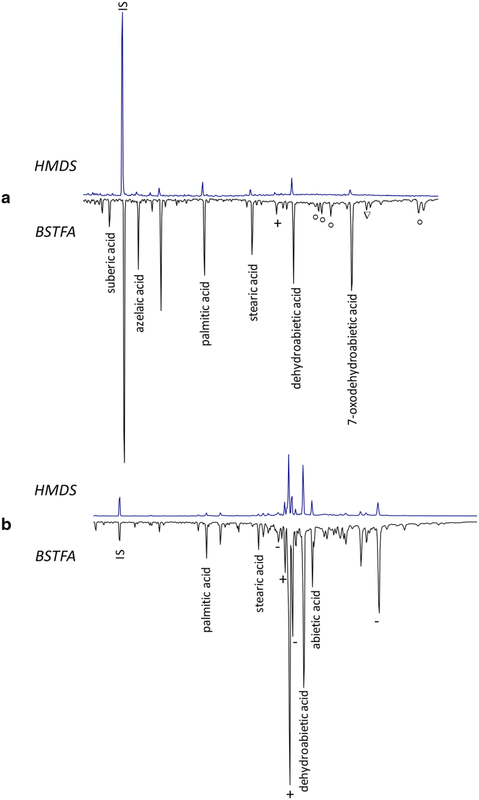 The GC/MS set up is reported in “Derivatization of free fatty acids with HMDS” section. The GC/MS quantitative analysis of trimethysilyl esters of lauric, suberic, azelaic, myristic, sebacic, palmitic, oleic, stearic, abietic, and oxalic acids obtained after derivatisation with both HMDS and BSTFA was performed using calibration curves obtained operating the MS in Select Ion Monitoring (SIM) mode: lauric acid m/z 117–257, suberic acid m/z 149–303, azelaic acid m/z 149–317, myristic acid m/z 117–285, sebacic acid m/Z 149–331, palmitic acid m/z 117–313, oleic acid m/z 117–339, stearic acid m/z 117–341, abietic acid m/z 256–374, dehydroabietic acid m/z 239–372, oxalic acid m/z 73–147. HMDS is characterized by a low boiling point (125 °C) and by a relatively high vapour pressure at room temperature and pressure, while BSTFA is characterized by a similar boiling point (155 °C) to HMDS but by a lower vapour pressure . The TMS derivatives of fatty and dicarboxylic acids feature a good stability at room temperature due to their high boiling point, in the range of 200–400 °C and their relative low vapour pressures. Taking these aspects into consideration, we hypothesized that it is possible to evaporate under nitrogen flow at room temperature the solution containing HMDS to remove the excess derivatizing agent and the solvent, without affecting trimethylsilyl esters of the analytes of interest. GC/MS analysis of the TMS esters produced from both free acids and carboxylates. The scheme of the proposed analytical procedure is shown in Fig. 1. Mixtures of a standard solution of fatty and dicarboxylic acids and known amounts (10–40 µg) of lead palmitate and stearate were analysed in triplicate according to the scheme described before. Derivatization yields were calculated based on the content of fatty acid carboxylates in the synthesized metal soaps evaluated as described in paragraph 2.1. The analytical results are reported in Table 1 and show that the proposed approach can successfully discriminate and quantify mixtures of free fatty and dicarboxylic acids and carboxylates of free fatty and dicarboxylic acids in the same sample aliquot. The new analytical protocol was then tested in triplicate experiments on a solution containing abietic acid (10 µg/g) mixed with lead abietate (10–40 µg), in order to explore the possibility of discriminating and quantifying mixtures of terpenoid carboxylates and acids. Quantitative analyses were performed on the basis of calibration curves. Results are shown in Table 1, showing that abietic acid and lead abietate can be quantitatively determined with the described procedure. Limit of detection and quantification were calculated for all the species, obtaining values in the range 0.1–0.3 µg/g for the LOD and 0.2–0.5 µg/g for the LOQ. Moreover, intra and inter day reproducibility were evaluated, obtaining values lower than 6.0%. The new analytical protocol was tested in triplicate experiments on a solution containing oxalic acid (10 µg/g) and samples of calcium oxalate (10–40 µg). The results are reported in Table 1. Oxalic acid is derivatised by BSTFA but not by HMDS, and calcium oxalate is not derivatised by either silylating agents. The historical samples analyzed are a pictorial sample from Norwegian pulpit and a coating of a writing desk both from the second half of the seventeenth century. The writing desk belongs to the Museu del Disseny de Barcelona (MADB64160 reference number) and it has been previously analyzed by means of FTIR spectroscopy . 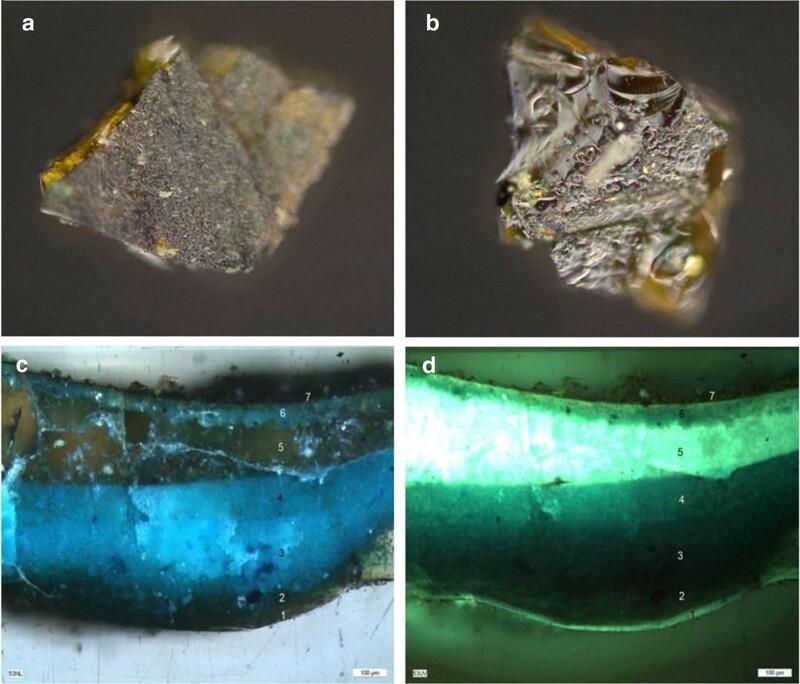 The sample showed a dark coating layer of around 50 μm applied on a silver foil on a red bole and a gypsum preparation. The coating layer consisted of a heterogeneous brownish material showing the presence of green particles (Fig. 2a, b). The infrared spectrum of a green area showed the characteristic absorption bands of verdigris (1602, 1444, 692 cm−1), copper II acetate monohydrate (Cu(CH3COO)2·H2O), while the brownish matrix showed the characteristic features of a Pinaceae resin (2933, 2872, 1706, 1460, 1386, 1240 cm−1) and the characteristic COO− antisymmetric stretching band at 1612 cm−1 together with a band at 1400 cm−1 associated to the symmetric stretching of COO− group of copper abietate. Copper carboxylates resulted from the reaction between the abietic acid and abietane skeleton acids from the resin and the copper pigment to produce copper salts. However, in the 1600 cm−1 regions, absorption bands of copper carboxylates (both copper acetate from the pigment and the salts formed as a result of the paint layer long term chemistry) and the resin C=C stretching bands overlap. A new band formed at 1400 cm−1 has been associated to the symmetric stretching of COO− group of copper abietate and used for identification and imaging of these compounds. The distribution map of verdigris (690 cm−1), Pinaceae resin (1700 cm−1) and copper abietate (1400 cm−1) showed the formation of carboxylates close to the pigment particles . The sample from the Norwegian pulpit was taken from the blue/green dress from one of the decorative figures. The sample shows a complex build-up (Fig. 2) made of seven pictorial layers from the transparent foundation layer (1) applied on the wood support to a superficial dark layer (7) passing by different green–blue paint layers (2,3,4 and 6) and a thick transparent layer (5). Both the foundation layer (1) and the transparent layer (5) show a white light blue fluorescence under UV light. A bulk sample of less than 1 mg was analysed by GC/MS by means of an analytical procedure that allows the analysis of the lipid, resinous and proteinaceous content of the sample . The analysis of the lipid resinous fraction of the samples permitted to assess the absence of a lipid material but the presence of abietane and pimarane acids and their oxidation products indicative of the presence of a diterpenoid resin. The main diterpenoid compounds identified are dehydroabietic acid (DHA) and their oxidation products dehydro-dehydroabietic acid (Di-DHA) and 7-oxo-dehydroabietic acid (7-oxo-DHA) together with other abietane acids. The presence of animal glue was also established from the analysis of the proteinaceous fraction due to the presence of hydroxyproline, marker of collagen, though the amount of proteinaceous material in the sample was between the detection and the quantitation limit. A sample taken from the backside of another figure showing only the thick transparent layer on the wooden support showed the presence of abietane and pimarane acids and their oxidation products (being dehydroabietic acid the most abundant) pointing to the use of a diterpenoid resin in this layer. In order to evaluate the performances of the new analytical method when analysing real paint matrices, including pigments and the cross-linked network of the polymerised paint, samples of increasing complexity were analysed. Table 2 reports the relative amounts of free acids (FA weight%), determined by derivatization with HMDS as the sum of the content of the quantified silyl esters of aliphatic mono and dicarboxylic acids normalized for the sample weight, and the relative content of free acids and their relative carboxylates (MS + FA weight%), determined by derivatization with BSTFA, as the sum of the content of the quantified silyl esters of aliphatic mono and dicarboxylic acids normalised for the sample weight. The relative content of the silyl esters of abietic acid (ABA%) and dehydroabietic acid (DHA%), as determined after derivatization with HMDS (FA) and BSTFA (MS + FA) are reported as well. 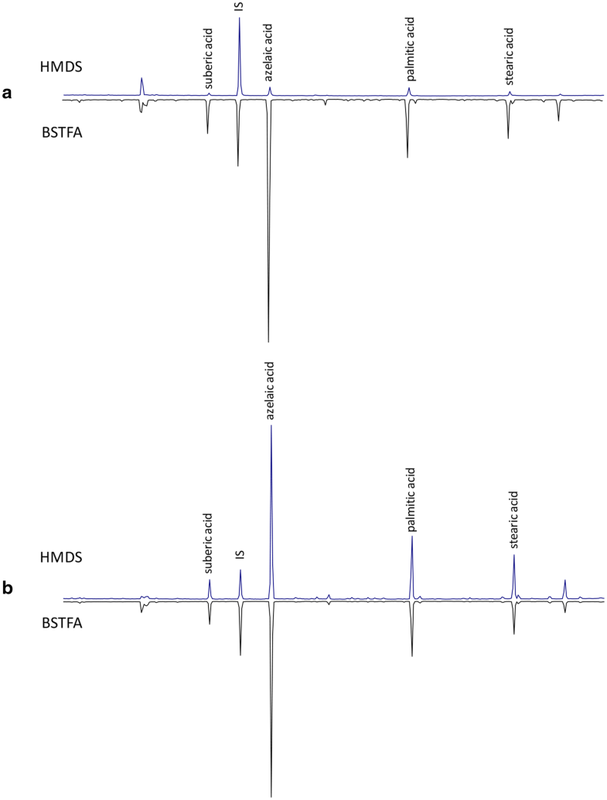 The chromatograms obtained in the analysis of the two model paint layers, one containing linseed oil and lead white (LW) and another containing linseed oil and vine black (VB), are reported in Fig. 3. These model paints were previously analysed with the original analytical procedure , entailing the derivatization of two sample aliquots. The data obtained with the new approach, reported in Table 2, are in accordance with the previously published results  (t-test, CI 99%). The two historical samples previously described were thus analysed: the paint sample from a Norwegian pulpit (B53) and the coating of a writing desk (DHU), both from the second half of the seventeenth century. The chromatograms obtained for the two samples are reported in Fig. 4. The main compounds identified in the chromatograms relative to the FA fractions of both samples correspond to diterpenoid compounds deriving from Pinaceae resin (pimaric, abietic, dehydroabietic and didehydroabietic acid). Both samples show significant differences between the FA and MS + FA fractions, highlighted by the higher relative amount of silyl esters of aliphatic and of terpenoid acids in the MS + FA fraction. This indicates the presence, in both samples, of metal carboxylates of fatty acids (palmitic and stearic mainly) and of diacids (suberic, azelaic and sebacic acid), and also of abietic and pimaric acids. The relatively high amount of dicarboxylic acids suggests the presence of a lipid material together with the resin: the application of this new approach does not allow to identify the precise origin of the materials and other approaches must be used for this purpose [34–40]. The Pinaceae resin shows different molecular patterns in the two samples. The sample from the desk varnish (DHU) contains mostly dehydroabietic acid and its oxidation product 7-oxo-dehydroabietic acid. The presence of copper carboxylates in this sample was evident based on the FTIR spectra . Copper carboxylates result in this case from the reaction between the abietane acids from the Pinaceae resin present and the copper pigment, verdigris, a copper acetate . The paint sample from the pulpit (B53) shows instead several peaks corresponding to pimarane and abietane compounds, among which the most abundant are pimaric and dehydroabietic acid (DHA). The relative amount of DHA with respect to its oxidation products, as well as the presence of pimaradiene compounds such as pimaric and isopimaric acids, point to a well-preserved Pinaceae resin, which had undergone to relatively little oxidation. This suggests the use of the resin in a non-superficial finishing layer of the complex sample stratigraphy: e.g. the foundation layer directly applied onto the wood support below the pigmented paint layers, or the thick brownish layer among paint layers. The presence of a consistent amount of resinates in the sample from the pulpit (B53) points to the formation of carboxylates due to the reaction of the abietane and pimarane acids from the resin from one or more unpigmented layer with the metal ions present in the adjacent pigmented paint layers, indicating the ability of the paint constituents to migrate through the different strata. In this work we presented an optimisation of a recently developed analytical approach, based on the sequential use of two different silylating reactions for the GC/MS analysis of mixtures of free aliphatic and terpenoid acids (transformed in the correspondent TMS ester by reaction with HMDS) and their free metal soaps (transformed in the correspondent TMS ester by reaction with BSTFA). This new analytical protocol can be applied on a single sample aliquot, which is an important requirement for a technique used to characterise precious and unique samples from works of art. This analytical approach proved also capable of characterising the molecular components of diterpenoid resins, and their products of reaction with metal cations present in the same or adjacent layers. The analytical results showed that this procedure is a useful tool to obtain a comprehensive picture of the molecular composition of the non-polymerised/esterified components of a paint sample, and to contribute to the study of the molecular changes undergone by the organic constituents of a paint layer upon ageing. JLN and ALT performed the analyses. JLN, ALT and IB performed the data elaboration. JLN, FM, ALT and IB planned the experimental set-up and wrote the manuscript. All authors read and approved the final manuscript.. Authors with to thank Donatella Banti, Aviva Burnstock, Klaas Jan van den Berg, Bronwyn Ormsby and all CMOP project members for the useful discussions. Authors wish to thank Catharina Blaensdorf and Barbara Wapler (Technical University of Munich) and Nati Salvado (Universitat Politècnica de Catalunya) for kindly providing the samples from the from the polychrome Norwegian pulpit and the coating from a 17th century a writing desk, respectively. The “Museu del Disseny de Barcelona” is acknowledged for allowing the access to the desk. Prof. Leslie Carlyle (REQUIMTE, Lisbon, Portugal) is thanked for providing the lead white and vine black paint layer samples analyzed in this work. Moreover, this work has received funding from University of Pisa project “Analytical chemistry for the knowledge of materials and techniques in modern and contemporary art” (PRA_2016_13). On request, the authors will gladly share other additional files and data not published in the article. This work was performed within the context of the JPI CMOP project: “Cleaning of modern oil paints” (Heritage Plus Joint Call Project 2015e2018). Sigma-Aldrich: Derivatization reagents: for selective response and detection in complex matrice. 2011. https://www.sigmaaldrich.com/content/dam/sigma-aldrich/migrationresource4/Derivatization%20Rgts%20brochure.pdf. Accessed Sept 2018.